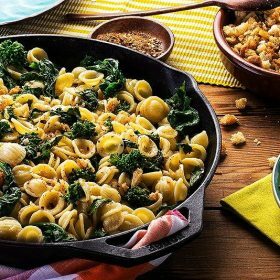 A wonderfully simple Italian comfort food, orecchiette with broccoli rabe (rapini) originates from the town of Monteleone in Puglia. Orecchiette is a small, ear-shaped pasta traditional of the Puglia region. 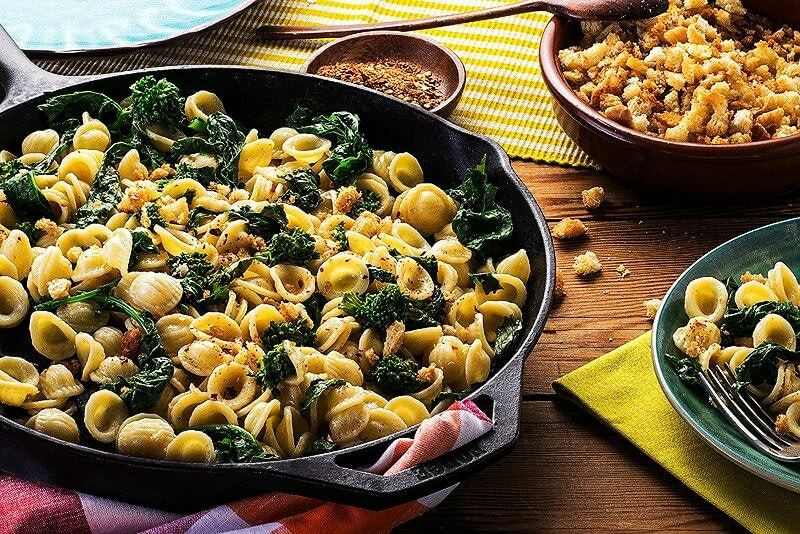 In Italy, they would make this dish with homemade Orecchiette, but if you aren’t going to make them yourself, you can always use the dried version. The secret is to cook the greens in the same water that you are going to cook the pasta in, so the pasta absorbs the flavor of the rapini. 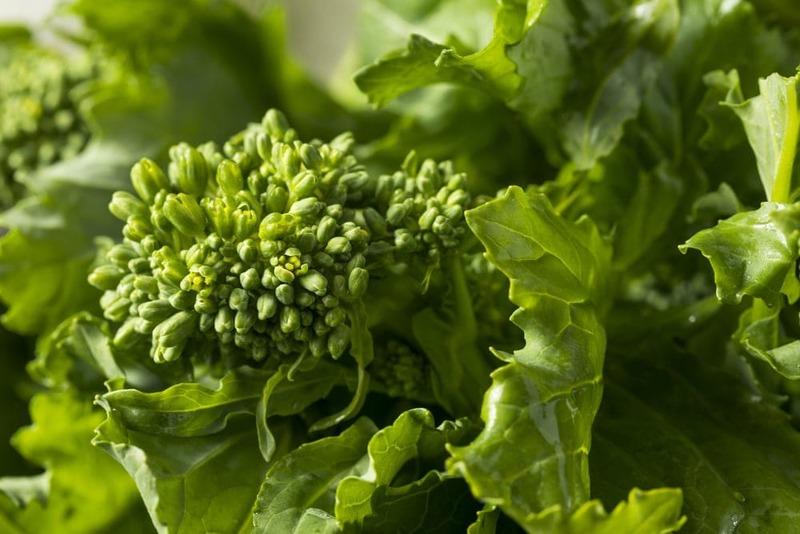 Rapini is a bitter green vegetable that slightly resembles broccoli but is from the mustard family, so it is incredibly good for you. There are just a handful of ingredients in this recipe, so don’t hold back when flavoring the greens … use plenty of garlic, chili flakes, olive oil, and a few anchovies to balance out the slight bitterness of the rapini. This recipe is a traditional dish of the Puglia region. It's a simple but delicious recipe. In a large sauté pan, heat the olive oil for 1 minute, add the anchovies, and stir until they melt. Add the garlic salt and chili flakes and cook until the garlic becomes fragrant. Bring a large pot of salted water to a boil, add the chopped rapini, and cook for 5 minutes. 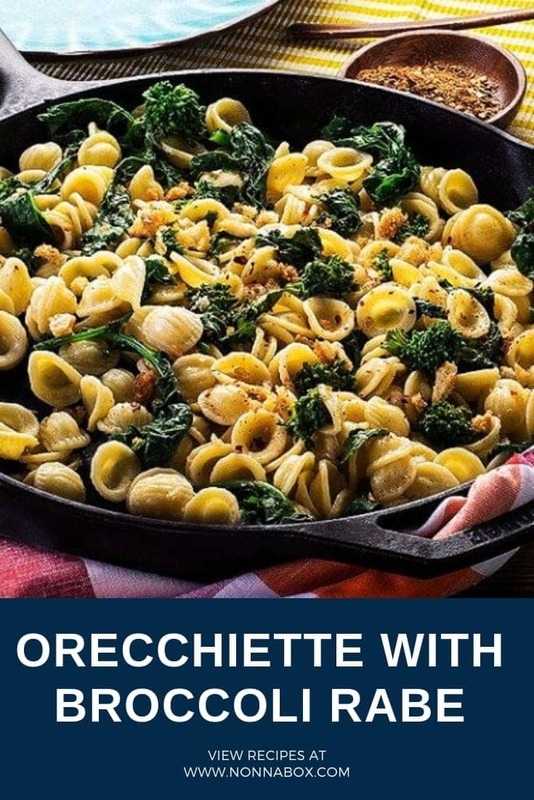 Add the orecchiette pasta and cook according to the label on the box, or cook for 4 minutes if using fresh pasta. When done, drain the pasta and rapini using a colander and reserve 1 cup of the pasta water. Place the sauté pan with the olive oil, anchovies, and garlic back on the stove and heat until the garlic starts to sizzle. Add the pasta with the rapini and stir everything together. Add some pasta water if needed. Taste and adjust the salt and chili if needed.